After reviewing the Reaper Bones purple worm I was left with a sloppily washed model sitting on my desk. Since it was already somewhat started, I figured I’d paint it up properly. Not really wanting an actual purple worm, I went for an earthy palette for the colours. As tends to happen to me, I was very lazy with the mould lines, and they ended up showing a bit too much for my liking. Something I might add to the review: on the soft plastic the mould lines are somewhat difficult to remove. Filing results in a mess, cutting easily takes away to much and scraping works, but not as well as with hard styrene. Of course due to the worm’s round surfaces and textures, mould line removing was more difficult and time consuming than usual. A question has been raised on the nets about whether the Bones models can be painted without priming. 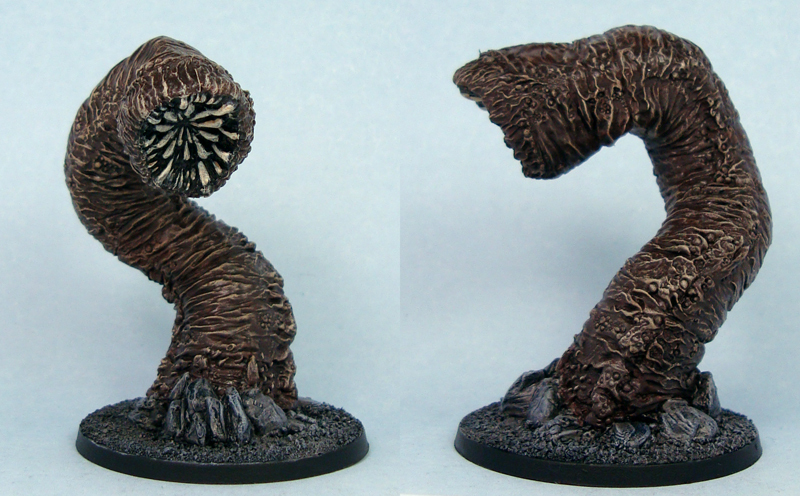 I didn’t prime the model (apart from the wash) but instead started painting with the base colour – in this case GW’s Dryad Bark. The model took the paint without any issues, so I’d say that’s definitely a time and paint saver on the Bones range. It’s a simple paint job, with progressively lighter brown drybrush layers over the Dryad Bark (GW’s Graveyard Earth, VGC’s Khaki, VGC’s Bonewhite and Elfic Flesh) followed by a wash of GW’s Devlan Mud. The teeth were painted individually with the idea of “the more the merrier”. The worm is based on a 50mm round plastic base and the moulded scenic base blends in nicely with my standard sand texture. Looks good. I have a WotC prepainted purple worm sitting around for years now, waiting for some attention. I prefer this model.